A Limited Edition of Nissan’s immensely popular Navara 4x4 dual cab ute has arrived. Powered by Nissan’s well-received YD25 diesel engine, the new Navara Outlaw is based on the ST-X model and adds 17 inch alloy wheels, chrome side steps, chrome bonnet protector, alloy nudge bar, fog lights, Bluetooth connectivity, soft tonneau cover and an Outlaw decal. The Navara Outlaw also comes with an upgraded stereo system comprising a six stack CD with AM/FM radio, MP3 compatibility and an auxiliary audio jack. All this extra equipment is available complete with a choice of special Outlaw Red or Midnight Black paint schemes for $47,990*, just $2,000 over the standard ST-X diesel’s price. The Navara Outlaw comes in six-speed manual or five-speed automatic transmission guises (the latter with a $2,000 premium). 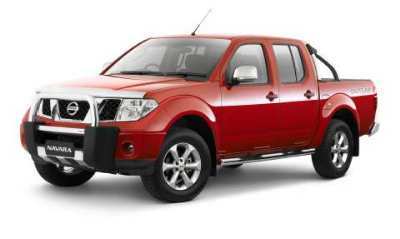 The Navara Outlaw joins a range of Nissan utes that are in high demand. In 2007, Navara 4x4 sales grew by 27 per cent to capture a full 22 per cent of the total 4x4 ute market. The 126 kW 2.5-litre common rail turbo-diesel engine delivers maximum power at 4,000 rpm and has a stump-pulling 403 Nm of torque available at just 2,000 rpm. And its low-range gearbox offers true go-anywhere traction. “The D40 Navara is a great multi-purpose 4x4. It offers the flexibility of a genuine five-seater with heaps of interior space, whilst still being a functional and reliable workhorse,” said Gavin Corcoran, Nissan’s product marketing manager for SUV and commercial vehicles. *All prices quoted are recommended retail pricing and do not include, metallic paint, dealer delivery and on-road costs.